The 10 Best Taco Places in Kansas! It takes a taco connoisseur to find the best tacos in Kansas, or maybe the locals will help you out. But don’t worry, we always have your back. From exotic eateries in Wichita, to authentic fare in Topeka, Kansas is home to some delicious taco joints. Here are our 10 favorites. What happens when you open up a taco stand and add hundreds of customers? You become Taco Lucha Mexican Restaurant in Manhattan. Order any of the delicious tacos and hopefully you won’t have to wrestle anyone for your taco! The Tacos Y Mariscos Guadalajara in Wichita serves up great traditional tacos and authentic Mexican cuisine. It doesn’t matter if you just want one taco or a dozen tacos, you will always come back for more. The Taco Republic in Kansas City serves original street-tacos and what the cooks prefer, the “real deal” taco. Enjoy tacos that use homemade tortillas and slow cooked meats, dine at the table or pick up an order for the road. Yum! Tucked away in the southeast side of Topeka is Tacos El Sol Restaurant and they have been serving customers a great taco diner for almost 20 years. The food is authentic and the wait staff is friendly. A true Mexican food restaurant in Kansas. Possibly one of the best tacos in Kansas can be found on the Taco Riendo food truck. The sauces are delish and the service is fast and friendly. Tacos that will make you want to flag this taco food-truck down! To find one of the best tacos in Kansas you might have to walk into a Mexican butcher shop. But the tacos at Carniceria La Siete in Kansas City are excellent. They are so good they were voted the best in Kansas by the website Spoon University. Good tacos, good food, good service is what make Casa Ramos in Emporia one of the best authentic Mexican family restaurants. 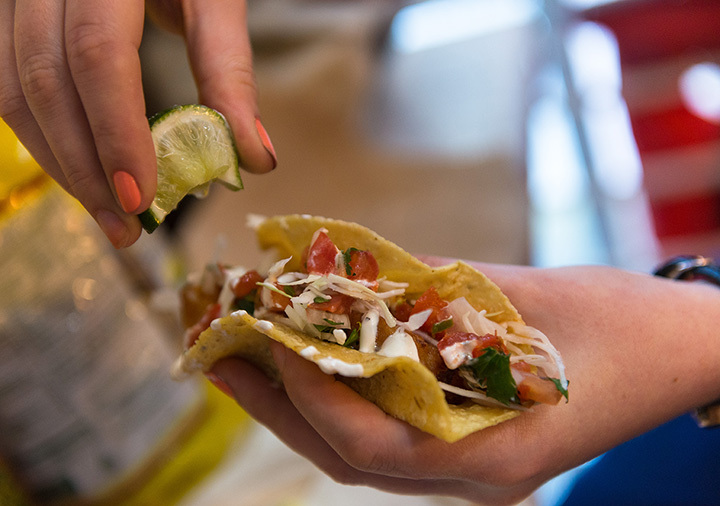 They prepare their tacos with the freshest ingredients, hot or mild since 2004. Build your own best taco at the “taco bar” inside the Border Bandito Restaurant in Lawrence. This cafeteria-style restaurant is known for its all-you-can-eat taco bar and fast friendly service. Making your taco dinner an event for over 40 years. It is the exotic ingredients that goes into every taco that makes the Elgave Restaurant in Wichita a great place to find a delicious taco. The distinctive taco selection is unique and different, but can satisfy the pickiest eaters, and the service is awesome.